284 pages | 13 B/W Illus. Much of the existing literature on happiness in Japan has been produced in the field of economics and psychology and is quantitative in nature. Here, for the first time, a group of anthropologists and sociologists jointly analyze the state of happiness and unhappiness in Japan among varying social groups in its physical, interpersonal, existential and structural dimensions, offering new insights into fundamental issues. This book investigates the connections between sociostructural aspects, individual agency and happiness in contemporary Japan from a life course perspective. The contributors examine quantitative and qualitative empirical data on the processes that impact how happiness and well-being are envisioned, crafted, and debated in Japan across the life-cycle. Therefore, the book discusses the shifting notions of happiness during people’s lives from birth to death, analyzing the age group-specific experiences while taking into consideration people’s life trajectories and historical changes. It points out recent developments in regards to demographic change, late marriage, and the changing labor market and focuses on their significant impact on the well-being of Japanese people. In particular it highlights the interdependencies of lives within the family and how families are collaborating for the purpose of maintaining or enhancing the happiness of its members. 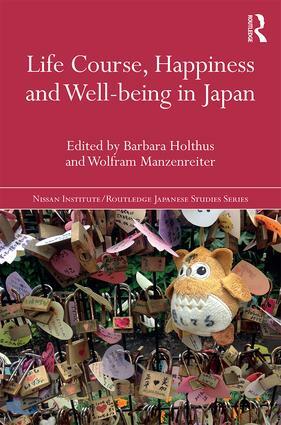 Broadening our understanding of the multidimensionality of happiness in Japan, this book will be of interest to students and scholars of Japanese Studies, Anthropology, and Sociology. Introduction: Making sense of happiness in "unhappy Japan"
Barbara Holthus is Assistant Professor at the Department of East Asian Studies, University of Vienna, Austria. Her most recent publications include Parental Well-Being in Japan (2015) and a co-edited volume on Happiness and the Good Life in Japan (Routledge 2017). Wolfram Manzenreiter is Professor of Japanese Studies at the University of Vienna, Austria. His most recent publications include Sport and Body Politics in Japan (Routledge 2014) and the co-edited volume on Happiness and the Good Life in Japan (Routledge 2017).